Sr. Mary Murray was a multi-talented woman deeply committed to mission but also one who has suffered greatly and for whom death came as a welcome release. Mary Murray was born into a loving family in Ballarat on 24th October 1936, the fourth child of James and Elizabeth Murray. Her family were always very important to Mary and she often spoke of them and enlisted the prayers of the Sisters in their times of distress. 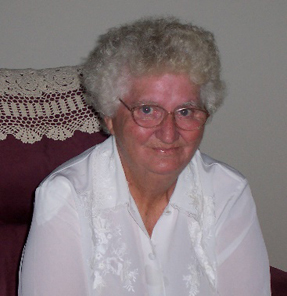 After school, Mary worked as a typist for a solicitor and for three years in an Industrial Chemistry Laboratory. On 15th November 1958, Mary left home and began her postulancy to become a Missionary Sister of the Society of Mary and made her first profession on 8th December, 1961. Sr. Mary gave service at Wahroonga and on the novitiate staff before being sent for her general nurse’s training in 1967 followed by her midwifery in 1970. Sr. Mary passed all with great distinction. 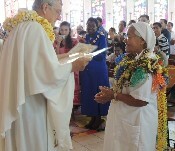 At last in December 1971, Sr. Mary left for Bougainville where she worked as a nurse in Tunuru, Moratona and Monoitu. 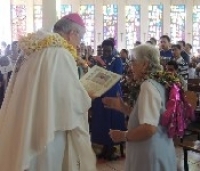 Even though Sr. Mary loved her work as a nurse, in 1975 she began work as secretary at the Melanesian Institute in Goroka in the highlands of PNG. In 1978, Sr. Mary returned to Australia and the following year began her studies for a Diploma in Theology which she gained in 1982 again with great distinction. Sr. Mary then went to Rome for a time of spiritual renewal and visited the Sisters in Bangladesh on her return journey in 1984. While there, Sr. Mary taught the Sisters to use the vacuum extractor, an instrument used to deliver babies. 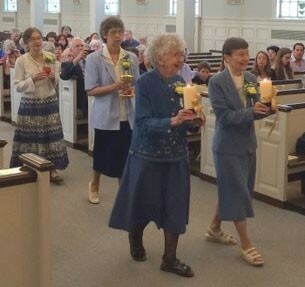 Sr. Mary loved to share her many talents and to teach others. In 1985 Mary was in Australia waiting for her visa to return to Bangladesh and had some dental work done. She collapsed in the dental chair and for several days, her life hung in the balance as she battled a major infection in her jaw. 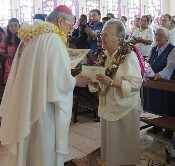 However, she recovered and much to everyone’s amazement she left for Bangladesh in January 1986 to work in the Catholic Communications Centre, technically as a theologian but Sr. Mary also shared her talents of organization and photography. In Dhaka Sr. Mary lived with Sr. Mary Rita Philippon and Sr. Mary welcomed to the flat young Catholic students who wanted to study and discuss their faith. Another of Sr. Mary’s gifts was her ability to inspire others to become involved in mission. Before she had left Australia, Mary had gathered a group of co-missionaries mainly from the Lindfield parish. The infection in her jaw flared again and Mary returned to Australia for home leave but was not able to return to Bangladesh. In the hope of more advanced treatment, Sr. Mary was referred to England as this chronic infection had spread to other bones and she had periods of severe pain followed by long periods of moderate pain. Nothing helped, so Sr. Mary returned to Australia in 1992 still suffering. On her return, Sr. Mary became a resident in our aged care facility but it was not suitable as she needed space and to go at her own pace. So, in 1998 she moved to the Wesleyan retirement village at Carlingford. One of Mary’s many gifts was her green thumb; she loved gardening and especially growing roses. The beauty of her garden often led to conversations with other residents and their visitors - dialogue of life at an ecumenical level. Despite her illness, Mary would do mission talks when she could. It was from that village that Mary transferred to Southern Cross village at Plumpton in 2004. Sr. Mary loved her unit and immediately set about getting her garden growing especially the roses she brought from Carlingford. 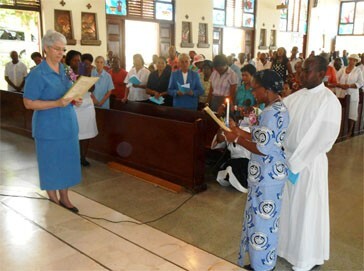 All went well until that fateful day 24th April 2008 when Sr. Mary suffered a severe stroke. if Sr. Mary’s stroke had caused a paralysis, it would have been easy for us to understand how severely her brain was damaged. 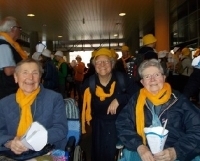 However, the stroke affected her ability to process information and to solve problems. All this was very frustrating for Sr. Mary as she could not understand why she could not get the TV to work, why she could not send emails anymore or use the computer to make cards as she had done before. Our multi-talented, kind, generous, fun-loving Sr. Mary now suffered not physical pain but a permanent and increasing brain injury. As Mary’s self-control disappeared, the bottled up anger and frustration spilled out. It is a grace that Mary’s last day was peaceful and the Sisters and her friends, the Irelands, kept vigil with her. We are very grateful to the staff at St. Francis Apartments who gave such great care to Sr. Mary and have always respected her dignity. At last, when the nurses were busy with the handover, Mary slipped away at 10pm on 5th October 2016. We give thanks to God for the life of Sr. Mary Murray, a woman of faith who shared her many talents in the service of the Kingdom of God. We pray that her many years of pain - both physical and psychological - will bear fruit in our lives and in the Church.